Babies born in Kenya named after Obama visit—including one AirForceOne Obama. 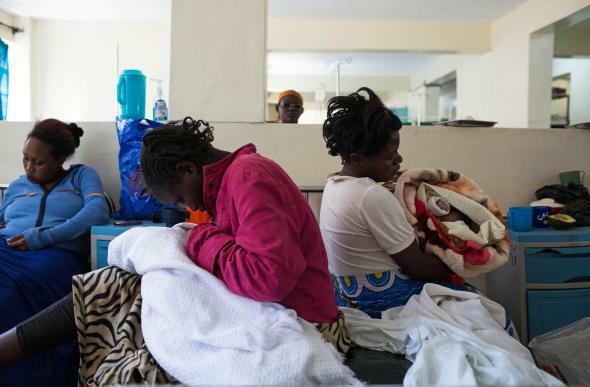 Named after President Barack Obama and First Lady Michelle Obama, newborn babies Obama (right) and Michelle (second from left), are held by their mothers Lucia Kagotha (second from right) and Millicent Akinyo (third from left) at the Mbagathi Hospital in Nairobi on July 26, 2015. It’s an Obama baby boom. President Obama departed Kenya on Sunday and left quite a legacy behind, as more than a couple of babies were named in his honor. Although the name Obama is already relatively common in Kenya, two women decided to name their babies after the president’s jet over the weekend. “I have decided to call my baby AirForceOne Barack Obama so that we can all remember Obama’s visit to Kenya because it is a huge blessing,” one of the mothers tells AFP. Another one decided to simply call her baby “AirForce One.” They were two babies out of eight born on Friday night at one hospital named in honor of Obama. And it wasn’t just boys. One girl was named Michelle, while another was called Malia, and a third Malia Sasha.